Growing up in a world full of prepared foods had its benefits, no doubt about it. Any childhood in suburban America wasn’t complete without its fair share of bite-sized, toaster-ready snacks. But as fun as all of those foods were, my favorite meals were always ones with family—made from the heart, by hand, and ready to share. Many a summer evening saw us gathered around the table on my grandparents’ porch, enjoying a homemade meal. Though the flavors were varied and ever-changing, three steadfast components remained the same each time: meats hot-off-the-grill, a crisp and satisfying salad, and a creamy, cooling dessert. It always seemed so effortless, with bags of marinated meat magically appearing just in time to land on the grill. Salads would be prepped in large bowls on standby—waiting patiently for their dressings—and beautiful, layered desserts or simple scoops of ice cream would hit the table just as the sun was about to set. If it sounds idyllic, as it turns out, it was. 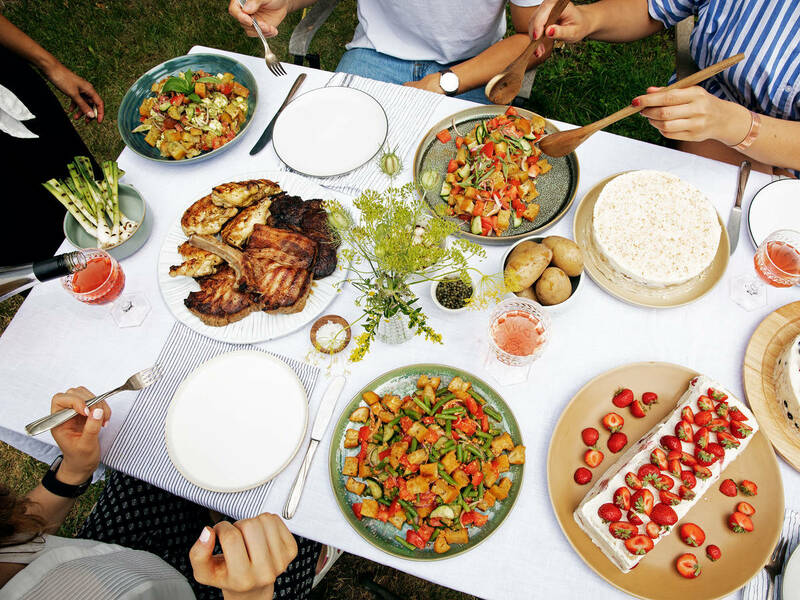 In the midst of trying to throw my own casual summer dinner parties, making everything from scratch and juggling hosting duties with it, I realized it wasn’t magic—it was a lot of work, no matter how easy my grandparents made it seem all those years ago. Here’s where we let you in on the secrets to summer party success. With these recipes in your back pocket, you can breeze through an evening with friends or family and cook up a simple, mix-and-match menu from scratch that’s anything but boring. The single most important thing to keep in mind when getting ready to host any party, is to do what you can ahead of time. You don’t want to sacrifice flavor, texture, or presentation—so choose recipes that actually get better as they age, so to speak. Doing all the hard work the day (or a few days) before the party, will not only give you more time to spend with your favorite party people, but will help you cut down on the clean up afterwards—a definite plus. A versatile kitchen machine like the Bosch OptiMum makes prep quick and easy, and can help you slice, chop, whip, and blend just about anything. Now, I might be biased, but the number one recipe that pops into my mind when I think “easy entertaining” is usually a marinated something. You can marinate practically anything from meats and cheeses to tofu and hearty vegetables, like squashes, bell peppers, broccoli, cauliflower, cabbage, and artichokes. Whipping up a couple of different marinades takes very little time but pays off big in the end—pretty much a set-it-and-forget-it technique made for entertaining. Try your hand at these recipes for simple marinades that can pair with just about anything. The BBQ dry rub is ideal for meats like steaks, chicken wings, and ribs. In addition to meats, the Italian-style lemon-herb recipe can make a great antipasti marinade for things like artichoke hearts, mozzarella, or roasted red peppers. The adobo marinade works best for meats like chicken or pork but can also be brushed onto grilled squash, used to marinate firm or smoked tofu, and (with the addition of water) can even work as a braising liquid for tough or fatty cuts of meat, like pork shoulder or pork belly. Any summer party spread is likely to include a salad of some sort. Whether it’s a grilled take on the classic Caesar or a simple tomato and mozzarella Caprese salad, there’s no getting around the fact that salads are a staple side that can shine in their own right—like our 3 takes on the hearty Tuscan panzanella. It’s built on a base of stale bread and tomatoes, making it easy to get creative with various add-ins and dressings to match the flavor profiles of other dishes. Making the ciabatta from scratch takes time but can, and should, be done a few days in advance—giving you the opportunity to impress your guests yet again. The bite-sized cubes of stale (or toasted) ciabatta soften up and take on flavor when mixed with fragrant basil pesto, tangy caper and tarragon vinaigrette, spicy ginger dressing, or a even nutty tahini dressing. Traditional takes on the salad add red onion and cucumber, but other thinly sliced, fresh or blanched vegetables can be added. Think green beans, lettuces, celery, carrots, or bell peppers; pretty much whatever you have on hand! Cheeses, nuts, herbs, spices, and things like olives, garlic, or eggs can also make excellent additions—just keep in mind the flavors or style of cuisine you’re going for and take heed not to add too much. The best part of any meal is, for most of us, something sweet: dessert. It’s the final act, the cherry on top that leaves you teetering on the edge between being too full and feeling perfectly satisfied. From scoops of refreshing sorbet or your favorite ice cream, cookies chock full of chocolate to a slice of indulgent cake, a pleasurable confection can take many forms, but one of the easiest, most stress-free homemade desserts for a crowd is definitely a no-bake icebox cake. A clean slate of sweetened mascarpone cheese and whipped cream can play host to any number of flavor combinations—from chocolatey to fruity, simple to complex. Give the people what they want by making one or more of these icebox cake variations for your next summer party. There are so many options for pulling together a dinner party, so many questions that you have to answer: How many people should I invite? How many dishes should I make? What wine should I serve? Let us take some of the burden off your shoulders with our homemade, endless summer menu that will satisfy any taste. Pick and choose which dishes to make or opt for the whole menu and let your guests decide. Jetting off to Italy—at least in your mind—has never been so easy. The flavors found in the lemon-herb marinated chicken are familiar and comforting, and the tarragon-caper vinaigrette presents something bold and new in the realm of panzanella salads. Crunchy amaretti cookies layered with sweetened cream, peaches, and blueberries layered into a cool and fruity cake can only topped by a glass of amaro and the sunset. Take the flavors of a Filipino adobo to the grill with our garlicky, spicy marinated pork chops. Paired with an Italian-Southeast Asian fusion panzanella salad and toasted coconut and banana icebox cake, this is an eclectic menu that’s both fun and tasty. Intensely flavorful and charred to perfection, this giant steak pairs with the classic combination of a basil pesto and mozzarella panzanella salad. Finish off the evening with a slice of strawberry-vanilla sweetness.